Did you know there are more than 200 garbage disposal units under 50 plus brands? That doesn’t make finding a good garbage disposal any easier, does it? The problem is amid this large number of options, it is almost impossible to find that just one garbage disposal you want for your kitchen. So I created a small list of the best garbage disposals. You can find the best disposal for any category, whether it is one with the most features or the best one for money, from my top 10 list. So believe me when I say, your search ends here. Which Are The Best Garbage Disposals To Buy In 2019? Click here to skip my detailed review and jump to the comparison table. During our review of garbage disposals, we found that Evolution Excel is the best among all. It is the most powerful a household garbage disposal can be (Those above 1HP are usually used for commercial purposes). It has a dura-drive induction motor which delivers a power of 1HP, powerful enough to grind anything that is allowed to be thrown down a garbage disposal. It uses a slow speed motor which runs at a speed of 1725RPM just like the Evolution Compact model but the 1HP power gives its blades some extra torque to cut through tough food items. It has an amp rating of 10.2A and operates at the normal household ratings which are 120V and 60Hz. This is a continuous feed type garbage disposal and it has a chamber capacity of 40 oz. It uses a 3 level multi-stage grinding system, including a GrindShear Ring, Tri-action Lug system and an UnderCutter Disk, which is superior to all other garbage disposals. This multi-stage grinding technology makes sure that even the hardest food wastes are ground to pulp. This is the quietest garbage disposal we came across during our review. It uses SoundSeal technology which consists of Anti-vibration mount, anti-vibration tailpipe mount, Quiet collar sink baffle and Sound Limiter insulation. Layers of insulation around the motor keep its operation quiet while the anti-vibration sink mount and tailpipe dampens any vibrations before them getting out. This machine is ultra-quiet and it is your best choice if you want a really quiet unit. The InSinkErator Evolution Excel is a premium machine made of high-quality stainless steel components. Unlike most other disposals in the market its grinding components, sink mount, grinding chamber and almost all components are made of stainless steel. This prevents corrosion and makes it more durable. In my search for the best garbage disposal, the Evolution Excel ranks the highest in build quality. InSinkErator Evolution Excel is the biggest garbage disposal (in terms of chamber capacity, not overall dimensions) on my review list. It has a height of 13” and a width of about 12”. Naturally this should take lots of space under the sink, but owing to its compact design it won’t take as much space as some other lower end models. By ‘compact’ what I mean is that InSinkErator reduced the height of this disposal and made it wider so it still has 40 oz. capacity but can be comfortably fitted under most kitchen sinks. If you are doing replacements, you will have to change the drainage pipes with new ones that are compatible with the product. The sink mount utilizes a Quick-Lock system so it is really easy to mount and unmounts the unit. What I find disappointing is that it doesn’t come with a power cord, and connecting a new power cord may prove tricky to some. This garbage disposer has a very sleek look. It is a beauty, and the stainless steel finish with light grey color is equally good. This is better than the Waste King disposers’ looks. Its compact design with a larger top diameter and a narrower bottom diameter provides a greater surface area that can hold a lot of garbage. It is stylish, and it looks great. The sound seal technology used makes it a better product and the multi-grind technology design sets it apart from the other brands like Waste King Brands. Evolution excel is a premium product when compared to the other products we reviewed. Therefore, if you are looking for a premium product, this is it. 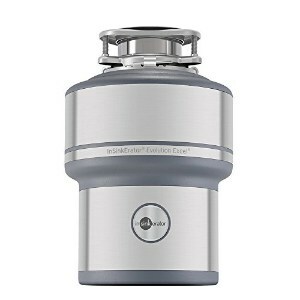 It is the best in the market and gives you the ultimate garbage disposal experience with all the great features it has. It has a 7-year warranty that is described as “we come to you” in-home part and labor warranty. This means that you can make house calls when a need arises. This warranty comes second after the Waste Kind L-3200. It is better than the rest. This is the only ‘batch feed type’ garbage disposal on our top 10 list. It has a 3/4 HP motor that keeps the disposal running at 1725 RPM. This Dura-Drive induction motor is powerful enough to grind most food wastes you can expect from a household kitchen. Its chamber capacity is 40 oz, which is exactly the same as that of the Evolution Excel model. Though much similar in class with the Evolution Excel model which I reviewed just above this model uses a 2 stage grinding system instead of the superior 3-stage system in the former. This is the 2nd quietest garbage disposal on our list. Similar to the Evolution Excel product this one uses Sound Seal technology and anti-vibration sink mount but is a louder. I have a video here in this post which compares noise levels of some InSinkErator models, this will give you an idea of the difference in noise levels between these two models. Evolution Essential garbage disposer is yet another premium product which is made completely of Stainless Steel (I am not saying the splash guard is stainless steel, you get the idea). It is corrosion proof and the steel grinding components make this machine more durable than most others. This comes at par with the Evolution Excel in terms of build quality but this is a batch feed disposal, (and it is the best batch feed garbage disposal) if you are ever planning to buy a batch feed disposal definitely go for this. 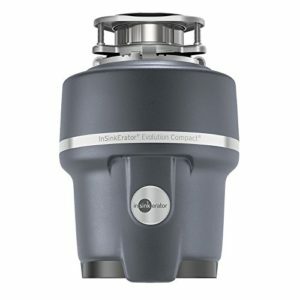 The InSinkErator Evolution Essential garbage disposal has the same chamber capacity as the Evolution Excel model (40 oz) but it comes with different outer dimensions of 14x10x13 inches. In terms of space, the overall height of this disposer is 14 inches which is 1” more than the Excel model, so this is not as compact as the latter. But again this is a batch feed disposal, so if you are looking to buy one of that kind this is the best choice. It also has the standard Quick Lock system which allows you to easily connect the disposer with the sink mount. And as in every InSinkErator model this one doesn’t come with a power cord which was frustrating to me as well as for most other customers. The drain connection pipe is 1.5” dia which is standard across all garbage disposals. This garbage disposer has a streamlined body and a compact design that helps to have high chamber capacity while making it compact and great looking. The overall presentation is attractive, stylish, fashionable and beautiful. The bits of silver color present blends perfectly with the grey color giving it an excellent look. This is also the only premium level disposal which is batch feed type. So, definitely don’t expect this to be cheap. This is It is in the same class as the Evolution Excel. But I should say this is with the money considering all the excellent features it comes with. The warranty offered InSinkErator is a six years in-home limited warranty. This includes house calls in case you have a problem that needs to be addressed by professionals. I wish the warranty were a bit longer to assure prospects of its reliability. This is my kind of garbage disposal, not too pricey, has all the premium features, is compact and good looking too. The InSinkErator Evolution Compact garbage disposal is powered by a ¾ HP Dura-drive induction motor. It runs at a speed of 1725RPM consuming around 3-4KWH per year on regular usage. It operates at 120V, 60 Hz but needs slightly more Amps 8.1A, which is more than those of the Waste King models listed here. It is a continuous feed type garbage disposal and its grind chamber can accommodate 34.6 ounces of food wastes at a time. The large size and continuous feeding allow you to get rid of more wastes in a short time. Like its premium counter parts this disposal uses MultiGrind technology. In this case, it is a two-stage grinding system which includes a GrindShear Ring and Tri-action Lug System. This additional grinding stage helps to grind more solid food wastes, even small chicken bones. The Evolution Compact garbage disposal has good noise insulation. It uses SoundSeal technology, which is the name of a standard technology InSinkErator use on all of their high-end models for noise reduction, to reduce any vibrations and sounds. One of its customers even claims his unit is so quiet that the sound of the water running to it is louder than the grinding noise. One thing to note here is that the Evolution Compact is not as insulated as the Evolution Excel model which is the quietest of all. One reason is the comparably low powered motor. Since Evolution Compact uses only a ¾ hp motor the noise produced by it will be lesser than that by the 1HP motor of Evolution Excel. But in practice you won’t find much difference. The reason I am highlighting this is that you don’t have to go for the Excel model solely because it is quieter. Evolution Compact garbage disposer is a more economical, compact version of Evolution Essential in terms of build quality. All the grinding components and sink mount are made of Stainless Steel but the grinding chamber is made of high quality, corrosion resistant plastic. A steel grinding chamber would have been better but still, this product is durable and lasts more years than many other economical versions. In terms of build quality it is the 3rd best garbage disposal I came across during my selection process for this review. The Evolution Compact, as the name says, is a really compact unit made to fit in almost all kitchen sink spaces. But it also has ample chamber capacity to process large amount of food wastes. The disposal has an overall height of 12.25 inches with an approximate width of 8.75”. Its installation is done via a 3-bolt system. It comes with a quick lock system where you just have to twist and lock the disposal if the 3 bolt mount is already set. This allows for a fast and easy installation when replacing other similar disposals. Since no power cord is included with this disposal, you will have to spend a little more time doing the wiring. This InSinkErator garbage disposal is made of stainless steel, and it has a perfect black enamel finish which is ideal for breaking the monotony of gray. The black enamel gives it an excellent and perfect outward look. The compact design as well as the wider top and narrower bottom design allows for maximum capacity. The description of the warranty of this product is four years all parts and labor. This means that it is better than the Waste King L-111 and some others in my list. Despite having this disposal for the last 6 years without any complaints I wish its warranty is a tad longer because a longer warranty would give more confidence to buyers. The disposal is priced affordably though it comes with premium features. This is why it is no wonder that this disposal is the favorite of many, including me. Powerful high-speed motor with the best power per pound ratio. Priced cheap, totally worth every penny you spend. The Waste King L-3200 Legend Series is powered by a ¾ HP high-speed motor capable of running it at 2700 RPM. The motor is permanent magnet type which operates at 115V, 60 Hertz, and 4.5amps. This ¾ HP motor may not be the most powerful you can find in a household garbage disposal but it produces the most power per pound. This is a continuous feed type garbage disposal, you can add food wastes continuously while running it. This makes it easier to dispose of large quantities of food wastes in a short time. In Waste King L-3200, food wastes undergo only a single stage of grinding. But since this is a high-speed disposal only that single stage is needed to convert any kind of food wastes to pulp. This is one big fundamental difference between Waste King and InSinkErator brands, Waste King compensates for multi-stage grinding efficiency with a faster motor. Or maybe it is the other way around. Waste King disposals are NOT known for their quiet operation. Infact most of the Waste King models do not attempt noise reduction, most probably to reduce costs. Among their models the L-3200 disposer is the quietest one. Though not with ground breaking technologies used in top InSinkErator models this one is properly insulated and has rubber dampers on the mount to reduce any vibrations. It is not very quiet but it is quieter than many competitors including Waste king L-111, Moen GX50C or Badger 5 by InSinkErator. The L-3200 garbage disposal is one of the most rugged products by Waste King. All its grinding components are made of Stainless Steel for better performance and durability. The cutting chamber is made of glass filled polyster, a kind of high quality fiber glass material with good strength and hardness. The build quality of the unit is similar to that of the Evolution Compact model by InSinkErator, but this one is way cheaper. The L-3200 garbage disposal has a width of 7 ¾” and a height of 13 5/8”. This is also one of the biggest sized garbage disposals by Waste King. It uses EZ sink mount system that is very easy to install. (You can read more about Ez mount vs 3-bolt here). The instructions that show you how to mount the garbage disposal are simple, and you will experience no hurdles during the process. What I love about Waste King units is that they come with power cords, so I don’t have to bother about buying and connecting a new power cord. It also has a removable splash guard, so it is easier to clean this disposal. This garbage disposer is made of stainless steel, and has an off- white/silver finish. They recently upgraded the design of the disposal and now it looks more stunning. Even so, the shape is not as appealing as the top InSinkErator products. The wider top part and the narrower bottom part design contribute significantly to its large grinding chamber size. 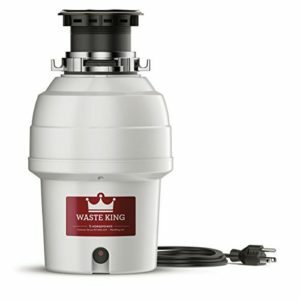 Waste King disposals are known for their cheap pricing and long term warranties. Compared to the topline InSinkErator models, this one is much cheaper. But when compared to other Waste King garbage disposals this may be a bit pricier. Even so, it is worth every penny because of all the great advantages it has over the others. To top this up, it has an eight years in-home warranty. The fact that it has such an extended warranty period shows that it is a quality product. It also offers a lifetime corrosion warranty, and this is part of the reason why you should choose this product. The GX50C by Moen is equipped with a 1/2HP, 2600RPM motor. This motor is Vortex permanent magnet type, which is similar to that in a Waste King disposal. Consuming 4.5 amps it operates at 115V and 60Hz. Note that the Amps rating is less when a permanent magnet type motor is used. This is a continuous feed disposal. Unlike InSinkErator top end models this disposal has only one grinding stage. Just like the Waste King L-3200 the lack of multiple grinding stages is compensated with the high torque provided by the high speed motor. This high speed rotation also allows reducing jams since the grinders cut through jams with more speed. A ¾ hp variant as well as a 1 hp variant is also available for this model. The GX50C uses SoundShield technology to shield the noise of the motor running. It is not as quiet as the top InSinkErator models or the L-3200 but it has decent noise insulation. Some customers mention regular noise and some compare it with Badger 5 in terms of running sound but I think it is more because people had higher expectations from such a beautifully designed product, not because it is actually noisy. The build quality of GX50C is similar to Waste King’s L-3200 garbage disposal but it has better looks. The grinding components of GX50C are made of stainless steel which is durable against corrosion. Its grinding chamber is made of high quality polymer which is also corrosion resistant. Overall this disposal is built well to boast of a long life time. The height of this garbage disposal is about 13-3/8” with a width of approximately 7 ½”. It is compact and fits perfectly. It uses a 3-bolt mount system. In addition it uses a universal express mount technology that involves a simple twist and lock procedure (this is basically the quick lock system of InSinkErator under another name). With simple instructions to follow, the process has been made simple. In addition it comes with a fitted power cord so it is simply plug and play once the mounting is complete. I find the design of GX50C more attractive than any of its competitors. It looks like the disposal have a layer after layer latex construction but it is just the expertise of the design. Coming in mostly black this disposal looks really classy and photogenic. The Moen GX50C is competitively priced. It has a four years limited warranty and comes with in-home services. If you are looking for a low cost disposal with good looks and good performance this is an ideal choice. It lacks premium features; then again this is not a premium product. Made by Waste King, the L-2600 series run with a 1/2HP motor which delivers enough power to be used in a normal household. Its operational requirements are same as that of the L-3200 series; 4.5A, 60Hz and 115V. This disposal is capable of grinding kitchen food wastes like small fish bones and fibrous veggies. Even with single stage grinding the 2600RPM high-speed motor easily grinds a continuous stream of any kind of disposal friendly food wastes within seconds. The motor is permanent magnet type which is standard across all Waste King disposals. This has better noise insulation than the L-111 legend series. In this garbage disposal, Waste King provides insulation for the grinding components which succeed in reducing noise to a certain level. In my experience it produces the same level of sound as a Badger 5, its competitor. The L-2600 model by Waste King is one of the most sold garbage disposals on Amazon and other similar ecommerce platforms. 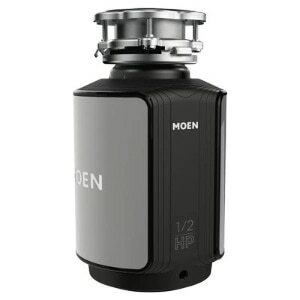 It is a strong competitor to the Moen GX50C garbage disposal in all levels. It is made of a premium quality material that makes it durable and long lasting when compared to others like the General Electric GFC520V, KitchenAid KCDB250G, and the Moen GX50C. Like the GX50C and L-3200 its grinding components are all stainless steel and the grinding chamber is glass filled polyster. Its build quality is not as good as the L-3200 but it gets the job done without any problems. Waste King L-2600 has a width of 6.8” and a height of 13.5”. These dimensions indicate that it is a sizable product and it is bigger as compared to some other products like the L-111 Legend Series. This product has an EZ-mount system that makes the mounting easy and does not require a plumber. And it comes with a long, 36-inch power cord. The design of this disposal is much similar to L-3200. It has an off-white/silver finish with a streamline design. This compact design allows it to be installed in under sinks where space is less. It has a stable flat and round base. Overall this one has a simple design which may not be as good as many of its competitors but still good. This Waste King garbage disposal is a pocket-friendly product, it is cheaper than the L-3200. However, this does not mean the quality is compromised. It is made of strong stainless steel material, and its grinding components are made of stainless steel also making it very durable. Other than that, these components are also corrosion proof. It is because of this durability nature that it has a five years in-house warranty as well as a lifetime corrosion warranty. This warranty is better than most of the competition, especially the ones by General Electric and KitchenAid. It runs on a ‘Vortex’ powered permanent magnet type motor just like the one in L-3200 series but it has only 1/3 HP of power. This is one of the least powered garbage disposals which are useful for light, occasional uses. It operates at 115V, 60 Hz, and 4A and runs at 1900RPM. This is a continuous type disposal so you can feed wastes without waiting for the first batch grinding to be completed. Like all Waste King disposals, this one uses single stage grinding. This is the least powerful disposal from Waste King but this is pretty much enough for a small household. The L-111 is one of the cheapest garbage disposals. To make it affordable no measures are taken for noise reduction, but please note that I am comparing this with the rest of my 9 picks, this is not actually that noisy. Generally speaking, this is one of the quietest among low-end disposals. In the opinion of several customers, this disposer is quieter than their old ones. During my review, I found that Waste King L-111 goes one step down in terms of build quality. Its grinding components are made of Galvanized Steel which is not as durable as its stainless steel counterpart. But the swivel impellers, which are used to smash food, are Stainless Steel. The grinding chamber, like the L-2600 and 3200 series, is made of corrosion resistant glass filled polyester. The dimensions of this product are 13.44” in height and 6.38” in width. This has the same chamber capacity as the L-2600 model but it is more compact. The difference is mostly due to the bigger motor the L-2600 has. The mounting system used is the EZ mount system, and it is very easy to install and does not require a lot of time. When you are doing a replacement, you will not need to replace the power socket, but you will have to replace the drainage pipes with new ones that fit perfectly and are of the right size. This kitchen garbage disposer has a more streamlined shape that is more appealing than the rest of the Waste King products. The selection of the colour is also not attractive as compared to the other brands. Even so, it is a product with a perfect finish and strength. This is cheaper when compared to the rest of the Waste King products assessed here. Even so, it is still an excellent choice. This has a fair price considering all the right qualities it exhibits. This waste disposal has a two years in-house warranty. This is not as great as the other Waste King products listed but it is better than the General Electric and the KitchenAid. The Badger 5 series by InkSinkErator has a power of ½ HP which is in the same league as the L-2600 model by Waste King. But this one runs at a lower speed, which is 1725 RPM. In fact, this is the standard running speed for all InSinkErator machines. It operates in 120V, 60Hz and 6.3A. It is a single stage machine and with a chamber capacity of 26oz. The Badger 5 is a quite popular disposal with hundreds of positive reviews on different online marketplaces. It doesn’t use any noise insulation but during my review, I found that it isn’t noisy like hell either. Badger 5 is InsinkErator’s answer to L-111 by Waste King. Both units match in popularity as well as build quality. 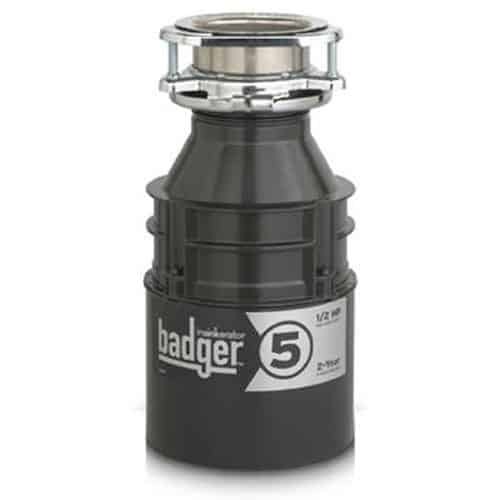 Same as its competition the Badger 5 garbage disposal’s grinding components are made of Galvanized steel, the swivel lugs made of stainless steel and the cutting chamber of a corrosion resistant polymer. Both units are equally durable and suited for a normal household of 2-4 people. The size measures a height of approximately 13” and a width of 7”. This is a smaller garbage disposal than all the above with a chamber capacity of 26oz which is only a little short of that of the L-111 and L-2600 models. In terms of space both the L-111 and Badger 5 occupies the same but the latter has a more powerful motor. The sink mount is 3-bolt type with a quick-lock setup for easy installation. This product has an excellent finish with enamel that is grey in color, and it is waterborne. It has a compact design that helps a great deal in ensuring that the product provides maximum space for waste accommodation. The design for the sink mount is also excellent as it makes work easy for anyone to do it. The galvanized steel material used to make it also contributes a great deal to its aesthetic beauty. Compared to the other products in this price range, this one is outstanding. This is an affordable garbage disposal for all people. When you are looking for a good garbage disposer at an affordable price, then this is the best choice you can go for. As compared to the rest of the disposers in our list, this is the most cost effective. It also has a two-year parts and in-home warranty. Shorter warranty period compared to competing products in the same price range. The KCDB250G series garbage disposal by KitchenAid has a ½ HP motor. It runs at an RPM of 1725 which is same as that of the InSinkErator garbage disposals I reviewed above. I searched their product manual and some online stores to see how much amps it takes to work but couldn’t find that info anywhere. It definitely works at 115-120V and 60Hz but we have no idea how much electricity it requires. Like the Badger 5 series, this disposal is also a continuous feed type disposal with single stage grinding. This garbage disposal has decent noise insulation. I should say it is as good as the Moen GX50C or may be better. The older units didn’t have noise insulation so the manufacturer added a sound insulator cover, and that does a good job too. 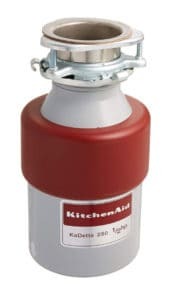 This kitchen Aid KCDB250G garbage disposer is made of a high-quality stainless steel material. It has a steel shredder ring that is made of galvanized steel, grinding wheel and chamber that are also made of the same material. Though it has the same chamber capacity as Badger 5, the KitchenAid garbage disposal takes up only a smaller area thanks to its compact design. It has a total height of 11 3/8” and a width of 6 5/8”. This one doesn’t come with a power cord so you will need to buy a new one or use that of an existing disposal. But even so, the package has simple installation instructions to follow. It also has a simple mounting system, and the instructions are easy to follow giving you a smooth installation experience. The stainless steel material used to make this garbage disposer gives it a good shiny finish. It has a compact design that makes it require minimal space under your sink which is better than the InSinkErator Evolution Compact. Its streamlined nature is also an added advantage. The silver and the red colours have blended perfectly, and the contrast has been brought out excellently. This is cheap, even so, it has some very great quality features that are impressive and can sustain a small household. Among all cheap garbage disposal machines, this is one of the best in the category considering it is also sound proof. The warranty to this product covers only one year, and it is the least among the rest. If any defects arise within the warranty period, the company will be responsible for the repairs. 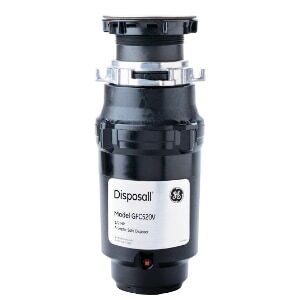 GFC520V is the best garbage disposal by General Electric. It is powered by a 1/2 HP motor capable of maintaining a speed of 2800RPM. The motor is permanent magnet type which reduces the electricity consumption to 4.5A. This appliance churns out enough power to grind most household food wastes. Its grinding chamber accommodates up to 27ounces of food wastes. This garbage disposer uses only a single stage grinding. This GE product doesn’t have any insulation, but like the Badger 5, this too is not unbearably noisy. This garbage disposal is built with stainless steel material of high quality making the product durable and also resistant to corrosion. The impellers are made of stainless steel, and the grinding chamber is made of corrosion proof material. This product is not as big as the other garbage disposers we reviewed but it is large enough to take care of your needs. It has a height is 12 11/16” and a width of 5 3/16”. This product utilizes the EZ mount system technology that offers an easy installation process that is free of struggles. Like the InSinkErator models, this one too doesn’t come with a power code attached so you will have to do a bit of wiring as well. The black color and the bit of silver color at the upper part have blended perfectly, and the contrast of the colors is perfect. The overall look is beautiful, and it has a stylish appeal and a classy look. When price is considered, this product is cheap, it is at par with the KitchenAid garbage disposal. Even so, this does not imply that it is substandard. When compared to the other cheap disposals, this one stands out because of the great features it has in place. The warranty given for this product by the manufacturing company is a one-year limited replacement and another additional one-year limited parts warranty. This is better than the warranty for the KitchenAid product mentioned. Quietest disposal of all. Uses SoundSeal Technology 2nd best noise insulation, uses SoundSeal Technology Good noise insulation, uses SoundSeal Technology Quietest disposal by Waste King. Comes at par with Evolution Compact Good noise insulation, uses SoundSHIELD sound insulation. The job of a garbage disposal is to grind food wastes to pulp. So performance is a must criterion for selecting a disposal. While power is an indicator of performance the most powerful disposer may not be the best performing one. For eg: a 1HP disposer is definitely more powerful than a 3/4HP one but a smaller disposal with a 3/4HP motor may perform far better than a large one with a 1HP motor. So the ability of a kitchen sink disposer to grind food wastes depends on both power and size which is why I used it as a criterion in my selection. Everyone agrees that noise is bad. The level of sound made by a garbage disposal is an important buying factor for many customers. People always prefer quiet disposals but the quieter ones always tend to be more expensive. Most low-end disposers do not have any noise insulations so as to cut costs. But there are some affordable choices as well. Since this is the second important buying factor in choosing a disposal I used this criterion to filter my choices. The quality of a product is an indicator of its longevity. Products with high build quality last longer. In the case of a garbage disposal, the build quality of its parts and components are of utmost importance. A garbage disposal made of good quality materials lasts for many years. The top-notch disposals are made entirely of stainless steel while in cheaper ones only the griding components are SS. It is impossible to include only the top end ones in my list because it needs to appeal to all types of customers. But still, build quality is a criterion I used here. Garbage disposals are not tiny gadgets, they take ample room under your sink. And like every product each disposal varies in size and shape, some are compact while the others are not so. Space and ease of installation is not a big buying factor but they also play a minor role. Looks are subjective, what appeals to me may not appeal to everyone. Does looks really matter for an appliance that’s fitted under your sink, hidden from your view? It’s no wonder then why manufacturers also try to make their disposals look better and better. So I included this criterion as well. Last but not the least, price and warranty are two important buying factors when considering any product. An ideal product is one that is cheaper with a longer warranty. But this never happens, usually only the top end products come with longer warranties. I have done my best to add affordable disposals to the list. If your household has only 1-2 people a ⅓ HP or ½ HP garbage disposal will suffice. Of course, the choice of a disposal also depends on the frequency of cooking. I would say a ⅓ hp disposer unit is ample for a dorm room kitchen but a ½ one may be needed for a household with regular cooking. Waste King L-111 – A good ⅓ HP model best suited for dorm rooms and the likes. Insinkerator Badger 5 – A much more powerful and much more popular disposal. Ample for any household with 1-2 people. Most households have 3-4 people. That’s why disposals falling in this category get the most sales. If your home has only 3-4 people a ½ hp disposal is good, a ¾ hp one is ample. Waste King L-2600 – a ½ hp model by Waste King. Waste King L-3300 – a popular ¾ hp motor by the same manufacturer. A typical large household has above 5 people including kids. For such a household you can choose either a ¾ hp disposal or a 1hp disposal depending on your cooking habits. 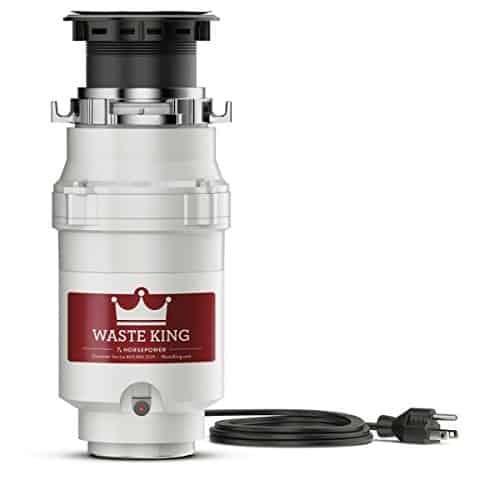 Waste King L-8000 – A 1 HP garbage disposal which has ample power to cut through anything that you throw down the sink. The view on which is the best garbage disposal is subjective. This is my best choice because the L-3200 has high-quality build, not so bad noise insulation, 3/4HP motor and a cheaper price tag. The Evolution Excel model is undoubtedly the quietest, most feature rich and premium looking of all the disposals I have reviewed here. It comes with a premium price tag as well but for those looking for a premium product, it is worth every penny. It is not surprising to find people asking so many questions about garbage disposals. After all many are buying disposals for the first time or after a long time. So I included a Q&A section answering some of the most frequently asked questions. How long does a typical garbage disposal last? The longevity of a garbage disposal depends on its build quality, the frequency of use and how it is maintained. High-end garbage disposals last for around 15-18 years while decent ones will work fine for about 8-10 years. How do I fix a garbage disposal that just hums? If your garbage disposal is humming when it is turned on that means it is jammed. In that case first, disconnect the disposal from your electrical circuit. Then try to rotate the blades using a stick or anything similar from above. If that doesn’t work look at the bottom of the disposal for a hole that fits an Allen wrench. A 1/4inch Allen wrench is the standard size across all disposals, try to turn the motor back and forth using it to unjam the disposal. In most cases, this will work, and you can connect the garbage disposal back to the electric circuit and see if it is working. If this doesn’t work remove all the food wastes you had added to the disposal and try to rotate the motor again using the Allen wrench. If this still doesn’t work and you are sure there is no more food wastes to jam the blades better call a technician. What brand of garbage disposal is best? The most popular manufacturers of garbage disposals are InSinkErator, Waste King, Moen, Kitchen Aid & General Electric. All brands have their own pros and cons but the most popular ones among the above are InSinkErator and Waste King, here is a comparison you can refer. What power garbage disposal do I need? Household garbage disposals range from 1/3HP to 1HP in terms of grinding power. Low power models are more economical so it makes sense to spend some time on deciding what power garbage disposal you need. 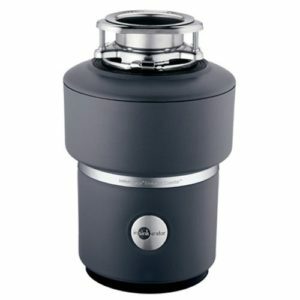 A 1/3 HP garbage disposal is suitable for small houses with 1-2 people where the frequency of use is less. A 1/2 HP power garbage disposal is suitable for small houses with 3-5 people with moderate use. Most people prefer a 3/4Hp disposal because they are able to process most food wastes and are suitable for a regular household. 1HP disposals are usually preferred by households with heavy usage. Not including the cost of the garbage disposal, it will cost around $120 to get a garbage disposal replaced. It usually takes 3-4 hours of work and is charged an average of $30/hour. The machine is overloaded – This happens for many reasons like running the disposal for a long time, clogs, overheating etc. in such cases the disposal is automatically shut down. In this case, you will need to manually reset the red button which is usually on its bottom side. Jammed disposal – In this case, the disposal blades are jammed. You will have to remove the food wastes inside and manually rotate the blades (disconnect electricity before that) to make sure the clogs are removed. Faulty Disposal – If the disposal is not working and it is not because of any of the above two reasons then the disposal must have got damaged. You will need the help of a technician in this case. What should and shouldn’t go down a garbage disposal? Here is a detailed list of what you shouldn’t put in a garbage disposal. Everything else that is organic food wastes can go down a disposal. Do you have to have a garbage disposal? Definitely NO unless you are required to by law, which I don’t think is anywhere. But many households in USA use them and it is also environmental friendly than sending your trash to a landfill. But if you are composting your food wastes that’s a far better option. How do you reset a garbage disposal? There is a red button at the bottom (or on the side) of every disposal. If your garbage disposal is overloaded that button will pop out and the disposal will be shut down. To reset a garbage disposal switch it OFF and press that reset button. Then run cold water for a few minutes and switch ON the disposal. Is it OK to put eggshells in the garbage disposal? Generally, for most disposals, it is a big NO. It is ok to add them once in a while but the general advice is NO. How do you clean your garbage disposal?